Trafalgar Square will surpass your expectations for events of any description. It is perhaps the largest banquet hall on ECR with a capacity to hold 700 persons. We understand your needs and tailor your show accordingly. Wood panelled interiors are interspersed with rich-looking mounted silk wall panels, bathed in mellow lighting. 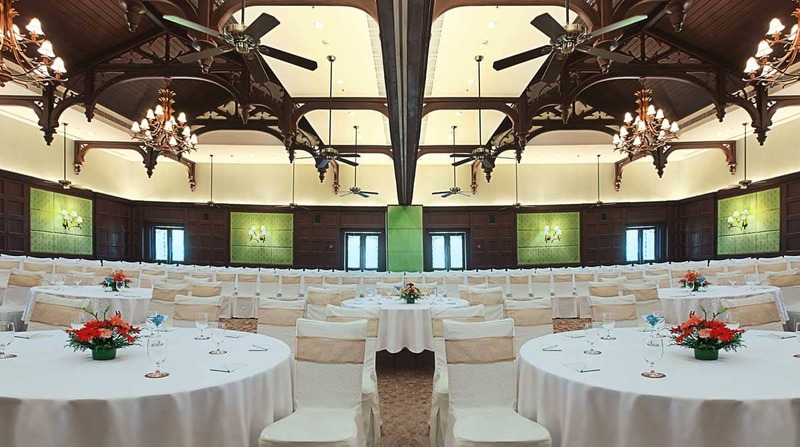 The decorative ceiling fans, trellised Gothic arches on the ceiling and etched glass doors infuse the conference hall with an old world charm, aristocratic elegance and distinctive character. This large hall is flexible enough and can be easily divided into two meeting rooms (Trafalgar 1 & 2) to hold 300 persons in each hall comfortably. It can accommodate two separate events or be used as a pre-function area. Ideal for a corporate event or wedding, Trafalgar Square comes equipped with air conditioning, sound system, WiFi, telephone and microphone points. AV system installation, video conferencing facility etc. can be arranged upon request. Trafalgar 3 is a break out room to handle the spill over and can comfortably accommodate 100 persons. Outdoor catering can be arranged in the attached lawn. The Resort’s reliable team of professionals will be happy to assist you for your dream function.